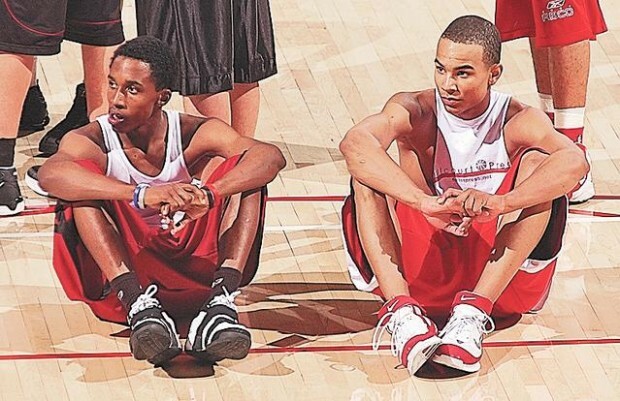 At an all-star camp two years ago, Brandon Jennings and Jerryd Bayless spoke excitedly to a recruiting analyst about wanting to play together for Arizona. More than once, it did not appear likely to happen. Jennings, who committed to the Wildcats on Tuesday, was being courted during the Arizona Cactus Classic last spring just as Bayless was pondering an imminent de-commitment to Arizona. Then, not long after Bayless recommitted to the Wildcats in August 2006, Jennings announced he would play for USC. In April, when Jennings backed off from the Trojans, the plan became possible again. In the end, Jennings committed to a school that had been recruiting him since his freshman year at Dominguez High School in Compton, Calif.
After Jennings chose Arizona, the Wildcats' other point guard target, Larry Drew, committed to North Carolina on Wednesday. "It's kind of ironic," said Clark Francis of HoopScoop, who heard the conversation about Arizona by the two star guards. "They both wanted to do it but came to it in roundabout ways." Both Bayless and Jennings attributed their de-commitments to making the decision too soon, early in their junior seasons of high school. But while Bayless was an in-state prospect who never left Phoenix, Jennings had the added complication of transferring as a junior out of Dominguez to Virginia's Oak Hill Academy. Rivals.com analyst Justin Young said the commitment came just as Jennings made his first visit home from Oak Hill, possibly complicated by homesickness. But, while Jennings said Tuesday he chose UA in large part because it was close to home, he found out he did not need to be in Los Angeles. "The nice thing about Arizona is they really protect their players," said Joedy Gardner, Jennings' longtime AAU coach in Southern California. "There's a lot of distractions here. But places like Tucson, North Carolina and Duke, it's studies and basketball. I think the environment is good for him." What surprised Gardner, though, is that Jennings realized it, too. Not just family or advisors. Although he is not expected to stay at Arizona for four years, Jennings said after committing Tuesday that he liked meeting with Arizona's academic advisors. He liked the fact that NBA players Salim and Damon Stoudamire came back to town, still working on their degrees. He told those close to him the same things. "He and his mom were talking about academics, and that shows you he's growing up," Gardner said. "When he went to Oak Hill they made him study, and he felt rewarded. He's fearless, and he likes a challenge." Oak Hill coach Steve Smith, who brings in talented inner-city players to the remote campus, said the transition ultimately helped Jennings. "He's matured over the course of last year both as a player and as a young man," Smith said. "He's really taken care of business and done what he's supposed to do. He knew he left Compton for all the right reasons. He wanted to focus and get away from it." On the court, Smith said, Jennings improved his distributor abilities, averaging 16 points and 11.5 assists per game in a backcourt with Duke-bound Nolan Smith and Kentucky signee Alex Legion. It was the continuation of a role Jennings played with Gardner's talented So Cal All-Stars and a role he will likely play in the future. "He played a role for me he's going to play in college — pass first — but he can score," Smith said. "He has three-point range and can get in the lane. He deferred to those guys (Smith and Legion), but there were nights he scored." That versatility and that maturity off the court are why so many basketball analysts rate Jennings highly. He is ranked the No.1 overall prospect by HoopScoop, No.7 by Scout and No.12 by Rivals. "Brandon is a really, really confident kid who is now starting to see the big picture," said Scout analyst Dave Telep. "He's becoming more outwardly confident. He's maturing as a person and a player."